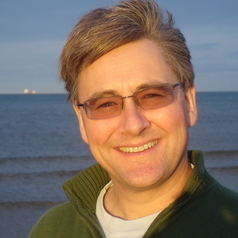 Professor Callum Roberts is a marine conservation biologist in the Environment Department. He was first tempted into marine science by a trip to the coral reefs of Saudi Arabia, where he studied behaviour and coexistence of herbivorous fishes. This led to a lifelong love of coral reefs and effectively dispelled his prior notion that marine science was all about freezing on the deck of a North Sea trawler knee deep in fish. In the early 1990s his interests in behaviour gave way to concern about the deteriorating condition of coral reefs, leading to his current emphasis on marine conservation. Currently, Callum's research focuses on human impacts on marine ecosystems. While his interests in marine conservation have blossomed over the years, his field research remains firmly rooted on coral reefs. On the islands of St. Lucia and Saba in the Caribbean, he has studied the effects of marine reserves closed to all fishing. Those studies revealed both the huge scale of human impacts on the sea, and the means of protecting marine ecosystems from such effects. He is now working to gain acceptance for marine reserves more widely, including in Britain and Europe where he is helping fishers to promote the concept within the industry and to politicians. Callum has served on a US National Research Council Committee on Marine Protected Areas and has also been a member of the Marine Reserves Working Group, headed up by Jane Lubchenco, Steve Gaines and Steve Palumbi at the National Center for Ecological Analysis and Synthesis in Santa Barbara. With this group he sought to develop a more robust theoretical underpinning for the design and implementation of marine reserves. In parallel with work on reserves, Callum has also been very active with the Coral Reef Fish Specialist Group of the World Conservation Union (IUCN). Working with many colleagues inside and out of this group, he has developed global maps of the biodiversity distribution of reef fishes and other faunal groups. These maps have revealed that marine species are more at risk of global extinction than previously believed. Many have small geographic ranges and life history characteristics that render them vulnerable to extinction. However, the maps also show ways to prioritise conservation investment into areas where those resources could be most effective. He was awarded a Pew Fellowship in Marine Conservation in 2000 to tackle obstacles to implementing marine reserves, and in 2001 he was awarded a Hardy Fellowship in Conservation Biology at Harvard University.